October 5, 2017, 4:24 PM · Happy Fall! Classes are steadily underway at the Conservatory, and this semester I’m in a wonderful string pedagogy seminar. Recently, we’ve had the opportunity to watch some expert violin teachers from around the Bay Area give lessons to little ones, and lecture us on how they begin their violin students, some as young as 2 or 3 years old, how they run their studios, handle parents, obtain students, etc. Each session is amazingly informative and helpful, especially since my primary goal is to be a teacher once I finish school. 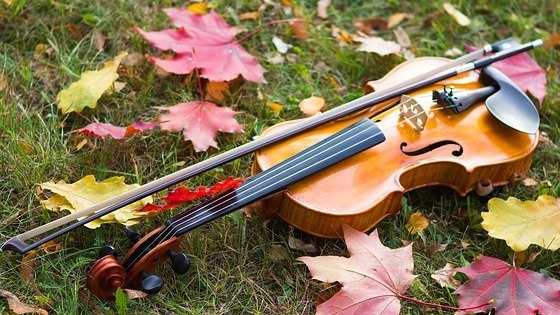 These sample lessons and lectures have also inspired me to improve my own playing by going back to the absolute basics of playing the violin. These exercises that are taught in the beginning do so much good for our technique and sound! I’ve taken on so many new and fun warm-up ideas from these seminars on teaching beginners, and would love to share these new additions to my technical practice. I've included approximately how long to spend on each exercise. Before even making a sound on the instrument, I move around and find a good balance and core *(a good way to find solid core is to bend your knees, evenly distribute the weight on both feet, and find a solid posture that isn’t leaning too far back/forward…to test your posture, have a friend gently push you on your left shoulder, lower back, and scroll when your instrument is in playing position. If you don’t move either way, you have found a solid core). Once you’ve found a strong stance, make sure you bend your knees and move around as you like (sway from side to side, twist to stretch your back, shake out the hands, etc.) Then, still without the violin, I practice circle technique: drawing circles in the air with the tip of the bow, which simulates the motion of down-bow chords by using the whole arm and releasing the muscles in the back. I do about 30 circles, keeping my arm and shoulder as relaxed as possible; feel free to stop when your right arm gets tired! After I finish doing circles, I usually hold my bow vertically in front of me and double check my bow hold, lightly tapping each finger on the stick, making sure my fingers are relaxed and fluid. All of this is really great to do during your practice session every once in awhile as well, just to keep things relaxed and give your body a break! Now with the violin! A good way to start off with the strong core and relaxed right arm that you’ve just found is to start with long bows on open strings, inhaling and leaning slightly to the left on the up bow, and exhaling and leaning slightly to the right on the down bow. This was taught to me as a beginner group class technique during Twinkle variations, and I think it works just as well when playing long open strings and in order to focus on your breath and movement, something I’m consistently forgetting to take a second to do during a long practice session. I usually try to do scales and arpeggios for a solid amount of time during the portion of practice I’ve set aside for my technique (depending on how much time I have to practice that day/how much repertoire I have to get through). I pick 2 or 3 keys and work through one, two, and three octave scales (sometimes with drone) in each key, using the Galamian acceleration pattern to start off slow and gradually gain speed in the left hand. I treat arpeggios the same way, focusing on light, relaxed shifts in the left hand *(a good way to practice relaxed shifts is to isolate the problematic shift, and slow it down, moving the finger ultra slowly and lightly so that you hear the harmonics on the string as you move toward the target note, then repeat several times). Again, don’t forget to incorporate your breath and whole body into all of these exercises!! We study technique in order to improve the functionality and quality of our playing, but it’s equally as important, if not more so, to focus on releasing tension, finding our breath, and locating a powerful core. These are things that beginners are constantly being reminded of (or, at least, should be reminded of) and are what advanced players often forget from being under so much pressure and feeling that we must always sound good, all the time. This is a ridiculous standard! Sometimes, take a second and play really ugly on purpose in order to relax and find some movement and release on your instrument…without worrying about playing all the right notes all the time. Have fun while playing your instrument. Never forget the meaning behind music and the message you’re trying to convey. I guarantee you that things will improve from this mindfulness, and your desire to relax and have fun will enable you to successfully send your musical message to your audience. October 6, 2017 at 10:31 PM · Great! I enjoyed reading this. Very sensible.